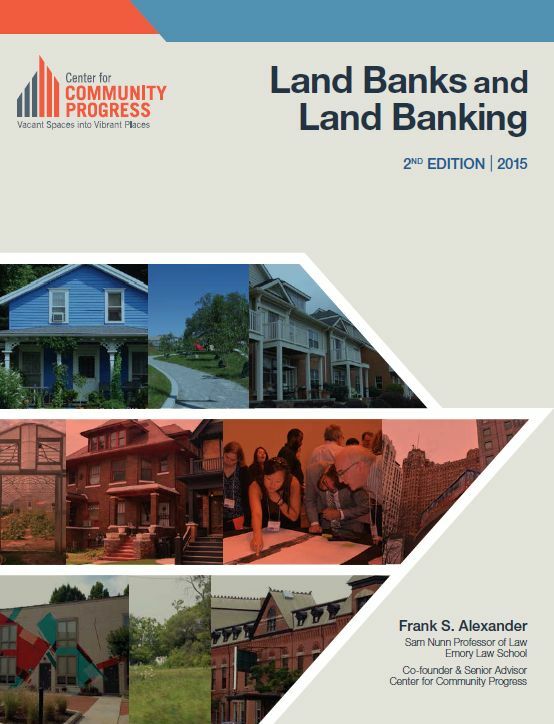 Frank Alexander wasn’t expecting his book, Land Banks and Land Banking, to wind up so big. But it has been that big. As Next City columnist Alexis Stephens has pointed out, only five states passed land bank legislation from 1971 to 2008. Yet eight states have passed such laws just since 2011. Delaware might be ninth to join the pack in the coming weeks. Alexander’s report has been regarded the principal text on the topic during this land bank boon, and it serves as a free, downloadable template for lawmakers working on drafting land bank legislation of their own. According to Center for Community Progress, there were only a “handful” of land banks in 2005. In 2011, they counted 79; today, there are approximately 120. The surge is part of the reason Alexander wrote a new edition, released today — to provide more background on land banking’s evolution and the newer examples that have sprung forth. Alexander lightheartedly describes himself a “Georgia dirt lawyer.” But if Rep. Dan Kildee of Michigan is to be hailed as the father of the modern land bank movement, perhaps Alexander, his fellow Center of Community Progress co-founder, should be regarded as its architect. But just because Alexander is one of land banking’s most prominent champions doesn’t mean that he’s advocating for its permanence. In fact, he hopes that as decades pass, they’ll fade from cities entirely. As the movement has grown in recent years, observers have pondered how powerful a tool land banks can be. This question will always be a hazy one because the services land banks can offer are always contingent upon their authority, and how that authority is exercised. For instance, Ohio is one of the only states that allows land banks to be involved in code enforcement. How this enhanced purview plays out in Cleveland is that the Cuyahoga Land Bank “blocks speculators, ensures that responsible occupants take control of homes, and holds home rehabilitations to proper standards,” according to HUD. The book aims, in light of such nuances, to better inform readers about the statutes behind those powers, and how to craft them to their locality’s best advantage. Land banks actually will show their ultimate utility, Alexander contends, as a tool to diagnose governmental and policy weaknesses that make the fight against land vacancy more difficult — where tax reform might be needed, which agencies aren’t quite working in concert together or which metros should be working on the dilemma as a region, to give a few examples. With these problems more visible, officials and lawmakers should be able to rectify them, leading to new statutes and more efficient agencies to foster a healthier built environment. And so, that ideal necessitates that successful land banks will spur their own obsolescence down the line. “Our hope is that one day land banks, and land banking — in all jurisdictions — will be in a position to declare victory and dissolve themselves as independent governmental entities,” the report reads. The questions that go along with Alexander’s template are huge: What are the city’s community development goals? What type of governmental entity will the land bank technically be? How will auctions take place? These issues, the report asserts, must be tailored to the community’s needs. And Alexander knows well that that’s the tricky part.